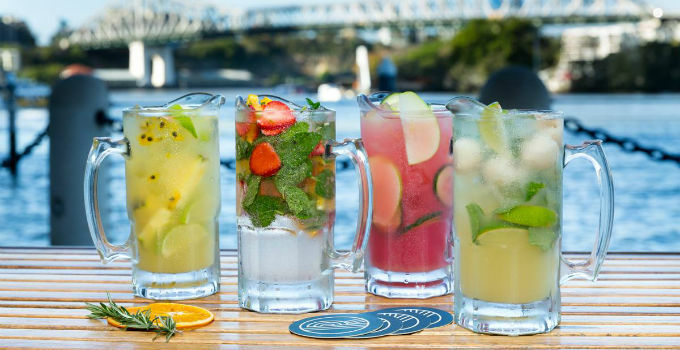 If we could shake up summer and put it in a glass, we’re pretty sure it would taste just like Riverbar’s concoction of Havana Club, lime, apple, lychee, mint and soda. Bonus points have to go to the totally sweet views – you might just forget that you ever felt steamy in the first place. You may need a touch of courage to brave the Brisbane heat, but Dutch Courage’s Lawrence of Arabia concoction is well worth it. With gin, Aperol, orange, passionfruit and citrus, it’s basically summer in a highball glass. Sometimes, you just can’t beat the classics, and when they come with riverside sunset views, why would you even want to? Especially when you can pair an Aperol Spritz with freshly shucked oysters at the Custom’s House pop-up bar from Wednesday to Sunday. Yep, spring was a bit of a late bloomer this year (jumpers in October? WTF Mother Nature? ), but The End is making up for lost time with this concoction of gin, quandong, orange blossom, lime and prosecco. You could just about imagine yourself on holidays on a tropical island if you found yourself on Friday’s riverside balcony, cocktail in hand and blue skies overhead. The fruity Damn those Hips combines passionfruit vodka, muddled lemon, passionfruit and cranberry juice for a sip that will cool you down quicker than any river breeze. The rising temperature may leave you a bit hot and flustered, but a Rosey Cheeks cocktail served high above the Valley skyline will truly bring about the right kind of colour. With Ketel One Citroen Vodka, sugar syrup, Aphrodite bitters and rosemary, we sure will be accepting this kind of rose. 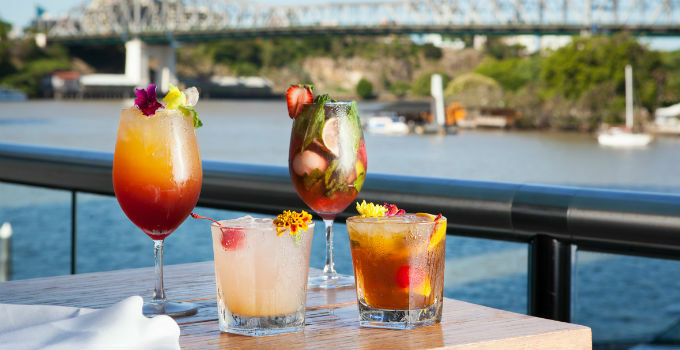 Don’t blame it on the sunshine, nor the Sun is Shining cocktail at this riverside spot. Think gin, Cointreau, mandarin, lemon & thyme syrup topped off with coffee syrup for the summer wake up call you really need. In a sharing mood? The Andy’s Garden Punch, with Tanqueray gin, Lillet, elderflower liquer, lemon thyme syrup, mint, cucumber and limes is a garden party that we can get around. It’d be a (sun)burn not to include Soleil’s tribute to the Egyptian Sun God, especially since it’s a damn good tribute: rum, creme de cassis, guava, apple, lime, spicy syrup and berries. We’re converted.